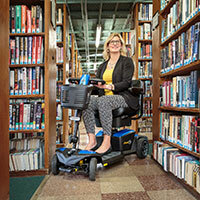 Billions of dollars are spent annually in the disabilities marketplace. This number is certain to increase as the current population ages and new generations grow. 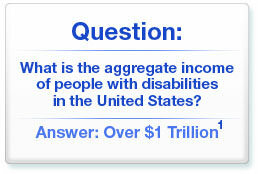 Current estimates indicate that number of Americans living with a disability is more than 54 million1. Each day presents new challenges for this unique population. As a result, demand is steadily increasing for new products, services and technologies to improve their quality of life. This creates a distinct opportunity and strong marketplace for businesses like yours. Initially launched in 1979, Abilities Expo is the nation’s leading event for manufacturers, distributors and service providers to showcase their products and services directly to the end-user and professional healthcare providers. Participate in this trend-setting event and get an edge on the competition, secure your market share and earn larger profits. Not only does Abilities Expo afford you a forum to showcase the fruits of your labor, it also provides a unique opportunity for you to engage the end-user and solicit valuable feedback. Understand first-hand how consumers utilize your products and services, and the advantages or disadvantages that they perceive. Consider it an extended focus group with your most important customers where the commentary you receive could radically improve your future business. To achieve these strategic business objectives in just three days, call (310) 405-1317 and register for Abilities Expo today! Abilities Expo will combine a high-visibility local advertising campaign—TV, billboards, newspaper and more—with a hardcoregrass roots initiative in order to draw the buyersyour product or service deserves. Broad-based media exposure attracts the end-user, while targeted trade advertising will bring in the professional community. Professional therapists and healthcare workers will learn from dynamic educational seminars. Don’t miss the opportunity to connect with these professionals whose considerable influence on buying decisions extend to not one, but multiple patients with disabilities. Deliver your product message to adult consumers and those with age-related fitness issues as they attend the compelling presentations and professional demonstrations that could make a substantial difference in their lives. Workshops feature topics such as intimacy, finance, fitness, caring for this growing population and much more. Families come to Abilities Expo for a well-rounded experience that is both informative and fun. They enjoy workshops and activities that are geared for the entire family, from kids to grandparents and those in between. Be there to introduce your products and services and educate attendees on their vital importance. Open during the entire 3-day event, the exhibits hall is your place to shine. Attendees come because it is packed with the latest technologies, products and services to improve their lives or the lives of their patients and loved ones. Your presence here will capture their attention when they are the most receptive. Helping you achieve your tactical business objectives is among our top priorities. Use these strategically crafted sponsorship opportunities to boost your overall exposure, leverage your presence at Abilities Expo and increase your booth traffic in this target-rich environment. Because of the shelf-life on the Abilities Expo Directory—attendees refer to them for months after the event—this sponsorship option delivers considerable bang for your buck. Catch the eye of potential buyers even before they hit the show floor by advertising on abilitiesexpo.com. Since many attendees will pre-register online, you have a unique opportunity to get them thinking about your products and services early. Select a high-profile header or footer ad and your offering will frame every webpage of the regional event. You can also prominently feature a photo of your top product or service in the new Product Showcase section on the regional home page. This photo will link to your company profile page which, in turn, links to your website. In order to ensure a high level of visibility, your product or service will rotate randomly in the Product Spotlight section with a maximum of 9 others. As such, the thousand of people with disabilities that view this page will see your offering no fewer that three times per minute. A prominently displayed 120x90 tile ad will highlight your sponsorship to an opt-in audience of thousands of prospective customers. There are only five sponsorships available per issue, which is published monthly. Reach out to pre-registered attendees before they set foot on the show floor by sponsoring up to four pre-show emails. Your company name, brief sell message and link would appear at the top of the email. These communications which convey vital show information and are well received by attendees. Consider the high-profile branding opportunity of the show bag that each attendee receives prior to entering the expo. Promote your company to thousands of viable prospects with a 4-color logo on one side or through an insert inside the bag. Only a limited number of slots are available, so act quickly. Use the seminar topic to more efficiently target consumers and sponsor the conference session of your choice. This option entitles you to signage outside and inside the seminar which features your name and logo, to have your company logo with the session listing online and in the directory, to hand out literature to seminar attendees and to introduce the speaker and say a few words about your company. For the ultimate in increasing brand awareness at Abilities Expo, sponsor the Events Arena. Signage illuminating your participation will appear prominently around the sponsored area. You will receive additional exposure through the website, pre-show promotional emails, the directory and onsite directional signage.